Conservative Leader Andrew Scheer, shown in this Oct. 16 photo, will use a news conference Thursday to urge Ottawa to blaze the way for a Ukraine mission led by Canada. The Trudeau government is facing increasing pressure to take a leadership role in war-torn eastern Ukraine by spearheading a UN peacekeeping mission to help stabilize the conflict between Kiev and Russian-backed belligerents. Growing support within Canada for such a deployment comes as the Liberals prepare to unveil a pledge to commit troops to United Nations peace support missions. Their plans are still confidential. 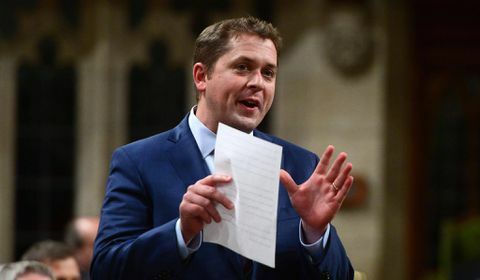 Official Opposition Leader Andrew Scheer is joining the call of a Ukrainian-Canadian lobby group in endorsing the idea of a Ukraine mission led by Canada. He will use a news conference Thursday to urge Ottawa to blaze the way for this deployment. A UN mission would nevertheless need to be approved by the United Nations Security Council, whose members include Russia. More than 1.3 million Canadians, including Foreign Affairs Minister Chrystia Freeland, can trace their heritage to Ukraine, where a three-year-old conflict between the Kiev government and Moscow-supported fighters continues. A UN peace support mission "would allow Ukraine to restore control over its eastern border with Russia, ensuring the Russian military stays within its own country, and out of Ukraine," Mr. Scheer says in remarks to be delivered Thursday. His Conservative Party is calling for a peacekeeping mission that would be located at the Ukrainian-Russian border rather than at the front line itself in the Donbass region of eastern Ukraine. The war in eastern Ukraine – which ignited after Russia annexed Ukraine's Crimean peninsula in early 2014, despite widespread condemnation from the West – has claimed more than 10,200 lives so far. There is currently no UN-mandated peacekeeping mission in Ukraine. Ukrainian President Petro Poroshenko has urged the UN Security Council to dispatch such a mission. He has also rejected a separate Russian proposal for a peacekeeping mission in the region as an effort to "freeze the conflict" in place. The Ukrainian Canadian Congress for several months has been calling both privately and publicly for Canada to lead a UN mission in Ukraine. The lobby group representing Canadians of Ukrainian descent has proposed this in briefings for the federal government and when speaking to MPs. UCC president Paul Grod said this proposal has the support of the Central and Eastern European Council of Canada, groups representing four million Canadians of Central European and Eastern European descent. In early September, Russian President Vladimir Putin proposed his own version of a peacekeeping mission – which critics called insincere but others suggested might be his attempt to find a way out of the conflict. Mr. Putin called for a peacekeeping force that would be limited to policing the front line of the war and restricted to six months, and focused primarily on protecting monitors from the Organization for Security and Cooperation in Europe (OSCE) who are supposed to be mediating ceasefire efforts. Eastern Ukraine has been a deadly place since April, 2014, and efforts to broker a stable ceasefire have failed. Canadian troops would face tremendous danger there unless the arms buildup in the region was scaled back. Shelling, shooting and mines or booby traps have killed scores over three years. The Office of the United Nations High Commissioner for Human Rights earlier this year said it had tallied up 10,225 deaths and 24,541 injuries in the three years of fighting between April 14, 2014, and Aug. 15, 2017. Those killed or injured include civilians, Ukrainian armed forces as well as members of the other armed groups, the office said. But established UN peacekeeping missions are deadly, too. The mission in Mali has recorded more than 130 peacekeeper deaths in the past five years. Earlier this fall, Prime Minister Justin Trudeau voiced support for a potential UN mission in Ukraine, during a visit from Mr. Poroshenko, but stopped short of committing Canadian troops. In 2016, the Liberals – eager to restore Canada's participation in peacekeeping missions after decades of decline – announced they were setting aside $500-million for such missions and pledged to send 600 soldiers and 150 police officers to UN peace support missions. The Trudeau government has been silent on commitment since. The Liberals are expected, however, to announce a peacekeeping pledge shortly as Canada prepares to host a summit on peace support operations in Vancouver starting Nov. 14. Mr. Scheer, in remarks he will deliver Thursday, says Canadian leadership in a Ukraine peacekeeping mission would be in line with Ottawa's strong support for Kiev over the last three years. "The defence of Ukraine's sovereignty and territorial integrity should be a priority for Canada's government on the international stage," he says. "Now is the time to act." Separately, The Canadian Press reports that Academy Award-winning actress Angelina Jolie is expected to lend her star power to next week's peacekeeping summit in Vancouver. A draft program for the two-day meeting says Ms. Jolie will deliver a keynote address at the event, appearing as a special envoy of the UN High Commissioner for Refugees and co-founder of the Preventing Sexual Violence Initiative. Representatives from 80 countries, including approximately 50 defence ministers, are expected to attend. The government has reportedly been in talks with UN officials about where to send Canadian peacekeepers; options include sending helicopters to Mali and Haiti, a transport plane to Uganda and troops to the Golan Heights.